Folkmanis 3070 – Experimenting with the thought of getting a new pet? 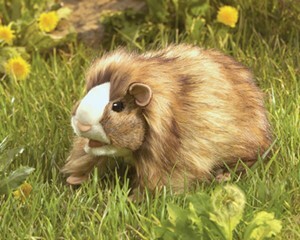 The Folkmanis® Guinea Pig puppet is the best starter pet ever! Also known as a cavi, this furry friend has movable mouth and legs. Happiest when cage-free and cradled in your hands, share the puppet antics with your animal loving pals. Movable mouth and forelegs. Measures 10” x 6” x 4”.